Fiber is known to be one of the most important dietary factors for healthy blood sugar regulation and diabetes prevention. A study in Nutrition and Metabolism supports this, finding that a drink made with a soluble fiber derived from barley, called barley beta-glucan, improved the body’s responsiveness to insulin and improved blood sugar control in people with mildly elevated blood glucose levels. Fifty overweight or obese adults who had high blood glucose levels but did not meet the criteria for type 2 diabetes participated in the study. They were coached in therapeutic lifestyle changes with a goal of weight maintenance, and were assigned to receive flavored drinks providing 6 grams per day of barley beta-glucan, 3 grams per day of barley beta glucan, or placebo for 12 weeks. Fasting insulin levels, which tell us how much insulin is circulating in the blood when the body is not responding to an after-meal blood sugar rise, decreased in the group receiving the higher dose of barley beta glucan, were approximately stable in the lower dose group, and increased in the placebo group. High fasting insulin levels are a hallmark of type 2 diabetes. Calculated scores used to estimate how well the body responds to insulin suggested that insulin sensitivity improved in people in the higher-dose barley beta-glucan group and stayed virtually unchanged in the lower-dose group, but worsened in the placebo group. Results from the oral glucose tolerance test suggested that only the barley beta-glucan drinking groups had better blood sugar control at the end of the trial. “This study suggests barley beta-glucan may slow the deterioration of insulin sensitivity for individuals at increased risk for diabetes mellitus,” the study’s authors said. Beta-glucan is found in foods like mushrooms, oats, yeast, and barley, but the exact structure of the beta-glucan molecule depends on its source. In other words, the beta-glucan found in oats and barley is different from the beta-glucan from mushrooms and yeast, which explains why it appears to have different properties in the body. 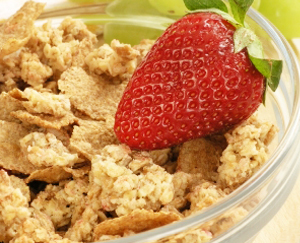 Previous studies have shown that beta-glucan from oats, oat bran, barley, and barley bran lowers cholesterol levels. The results from the current study add to other evidence that this same beta-glucan might help people regulate their blood sugar more effectively and prevent type 2 diabetes. Hulled barley. The whole, unrefined form of barley, also known as barley groats, is chewy and most nutritious. It can be used in soups or instead of rice under cooked vegetables. Barley grits. Grits are made from hulled barley that is toasted and cracked. Pot barley. Sometimes referred to as Scotch barley, this form of the grain is less refined and maintains more nutritional value than pearl barley. Pearl barley. This is the most commonly eaten form of barley. Pearling is achieved through polishing off the outer hull, leaving a less hearty but still fairly nutritious grain. Rolled barley flakes. Barley flakes maintain much of the grain’s soluble fiber. They resemble rolled oats and are usually eaten as a hot breakfast cereal. Barley flour. Barley contains less gluten than wheat so doesn’t always work in bread recipes. It is a good wheat flour substitute in recipes that don’t depend on yeast for rising, like quick breads and pancakes. Barley bran supplements. These supplements are as much as 60% beta-glucan.